I was trying to think of a punny title for this post with "distressed" (because of my distressed tee), and it got me thinking. Motherhood is hard. I'm stressed out the majority of the time. I stress about driving places because Ever fights me like crazy getting in the car seat. I stress driving because anything can happen at a moments notice. I stress when Ever needs a diaper change because, again, she fights me like crazy. I stress when I need to make dinner because she has to be into everything always. I stress when we're in public and she's crying or whining. I stress when I'm trying to eat at a restaurant because this kid can't sit still. I stress a lot. Obviously. And it puts tension on my relationship with my daughter, as well as my relationship with my husband. And that's not okay. Stress is natural, but it's something that can be taken care of. Sometimes I just need to remind myself to chill out, and that everything is going to be okay. Stress prevents me from being present in the moment, enjoying this fleeting time we have together, and realizing how truly blessed I am. I don't want to remember Ever's childhood as just a bunch of stressful moments. I want to remember it as being crazy chaotic but so beautiful all at the same time. My lack of patience lately is all stemmed from my lack of relationship with God. I need Jesus, desperately, and when the fruits of the Sprit are lacking in my life, it's a good sign that I need to refocus my priorities. I opened my Bible today for the first time in I don't even know how long, and I noticed my mind constantly trailing back to Instagram, my blog, money, my to do list. So I asked the Lord to help me just listen. And I started reading through Colossians and boy was I convicted. I get so easily distracted from the most important thing: my relationship with Jesus. If I'm not being filled up to overflowing with HIS love, then I'm pouring out nothing but emptiness, and eventually I'll be so dry and burnt out that I have nothing left to give. I cannot be a good mother without the strength and love of Jesus. I cannot be a good wife without the strength and love of Jesus. It's impossible. How cheesy is it that this tee shirt got me thinking all deep about motherhood? Ha! All that to say, I never would have seen the distressed tee trend coming, but I gotta say I'm on board. 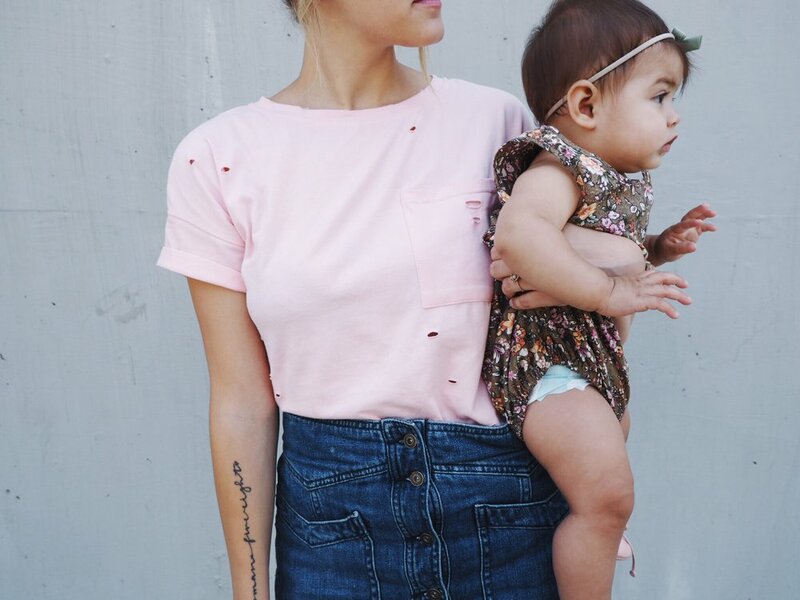 Why not make a plain t-shirt a little more interesting by adding some holes? Yeah, why not! I linked my outfit below. My skirt is by Free People, and it's out of stock, but you can find a similar one here + here + here. I can't wait to pair this skirt with some tights for fall! Other distressed tees that I love. Ever's romper is from Ivy & Jazz. Her shoes are from Little Pine Outfitters and her bow is from Gray & Mae. Our leather mat is from Gathre and the best diaper bag from Lily Jade.